Celebrating 10 Years Rated A+ At BBB! A decade with no consumer complaints filed against us. We strive to serve our customers in the best and most professional way possible. We work diligently to address consumer concerns promptly and concentrate on arriving at amicable solutions to those concerns that are satisfactory to our customers. As a result, our customers are extremely satisfied with our service. Our commitment to serving our customers and clients with our dedicated work ethic and quality of service will allow us to maintain our A+ rating with the BBB long into the future. Of course, reaching this important milestone puts us in the mood to celebrate and what better way to celebrate than to share this success with our current and future customers and clients? And since it would be difficult to pour you a glass a champagne, we've found another way to bring you into the party! FOR A LIMITED TIME, USE COUPON CODE BBBA+ AND RECEIVE 10% OFF YOUR NEXT PURCHASE* IN OUR STORE! We'd like to thank you, our customers and clients, for helping us to reach this proud milestone. It's an achievement we could not have reached without your support and patronage. Thank you, you mean everything to us. * Applies to in-store purchase only through our website and excludes Grid-Tie Solar Power Systems. If you're interested in pricing on a grid-tie solar power system, consultation is FREE. 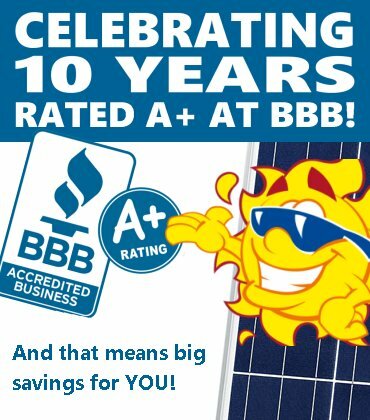 Call 888.680.2427 or email sales@mrsolar.com and we'll strive to make you the best deal possible to save you money.